Technicolor Kitchen - English version: Cinnamon pound cake with macadamia spice ribbon + "A Single Man"
Cinnamon pound cake with macadamia spice ribbon + "A Single Man"
Keeping up with my 2012 film goal, I watched “A Single Man” last night and what a surprise it was for me: I already expected something good – Colin Firth and Julianne Moore can do no wrong – but the movie is so visually striking that I felt like writing Tom Ford an email, asking him to make another movie soon. I love the way Ford works with the colors: a friend of mine called it “obvious” but I honestly disagree – I think it sets the moods in the movie in a very interesting way. The music is equally great – especially in the very beginning of the movie, with such beautiful takes under water – and though it hasn’t blown me away like the music in “Tron Legacy” and “Drive”, I thought it fit the movie like a glove. What a joy it is to see a young actor like Nicholas Hoult taking another risky character – several others his age would be afraid of taking this road, and he does it brilliantly. Julianne Moore doesn’t have much time onscreen, which is a shame, since she’s an amazing actress and looks glorious in 1960s fashion (being pale and freckled like her I was wishing I had that hair color) :). And Firth... Perfect would be the only way to describe his performance. All the pain shown through every muscle in his face (which reminds me of Natalie Portman in “Black Swan” and how much she could tell us by how her face looked, by the movement of her eyebrows). I believe the amazement is even bigger when we think of Firth in movies like “Bridget Jones” or “Love Actually” – how he can go from funny/silly to such a profound character. I was in awe at the end of the movie and strongly believe that the Oscars were given in an inverse order: Firth should have won in 2010 for “A Single Man” while Jeff Bridges should have won in 2011 for “True Grit”. When it comes to pound cakes no one can beat Flo Braker and Lisa Yockelson – the fabulous recipe below comes from Yockelson’s always delicious "Baking by Flavor" and if you do not have macadamias around please, do not let that stop you from making the cake: I believe that walnuts, pecans and even peanuts would be great substitutes here. Preheat the oven to 180°C/350°F. Butter a plain 25cm (10in) tube pan and line the bottom with a circle of baking paper. Butter the paper as well then dust everything with flour. In a small bowl, mix together the macadamia nuts, granulated sugar, cinnamon, nutmeg and allspice. Set aside. Make the cake batter: sift the flour, baking powder, baking soda, salt, cinnamon, nutmeg, allspice and cloves into a medium bowl. In the large bowl of an electric mixer, fitted with the paddle attachment, cream the butter on medium speed for 2-3minutes. Add the granulated sugar in two additions, beating well after each addition. Add the brown sugar and then beat until the mixture is light and fluffy. Blend in the eggs, one at a time, beating for 1 minute after each addition. Blend in the vanilla. On low speed, alternately add the sifted ingredients in three additions and the sour cream in two additions, beginning and ending with the dry ingredients. Scrape the sides of the bowl occasionally. Spoon about 1/3 of the batter into the prepared pan, then sprinkle with half of the macadamia mixture. Cover with half of the remaining batter, followed by the remaining macadamia mixture. Cover with the remaining cake batter. Using a palette knife gently swirl the layer together – do not scrape the sides of the pan. Smooth the surface and bake for 1 hour/1 hour and 10 minutes or until the cake is risen and golden and a skewer inserted in the center comes out clean. Cool the cake in the pan over a wire rack for 15 minutes then, carefully invert onto the rack. Peel off the paper circle then invert again onto another rack. Cool completely. Dust with icing sugar before serving. Gorgeous as always! Love the macadamia spice ribbon. Wow that looks amazing. How gorgeously tall. Love the subtle ripple throughout. Yum! I love Lisa Yockelson and have one of her cake books. I SO want to see this film!!!! Haven't seen it yet and I cannot wait! I have actually never made a pound cake. This one looks delicious though. 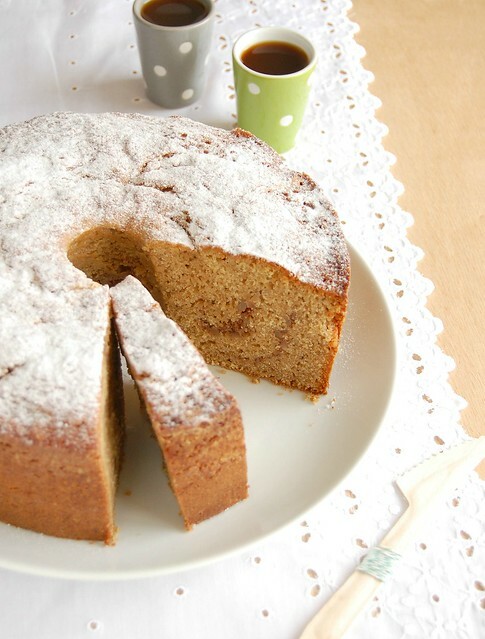 Lovely pictures, I really like cinnamon into anything so I'm guessing I would LOVE this cake! !